Musical instruments e-commerce is a competitive space. Having your own site and showcasing your products to the virtual world is good when your business is in the growth phase. The real problem is when your business grows. During this phase, you have to look for other alternatives to maximize your e-commerce sales. Given the niche you operate in, the first Third Party marketplace which must come to mind is ‘Reverb.com’. You may ask why not eBay, Amazon or even Craigslist? Why Reverb? The simple difference between Reverb and the other third party marketplaces is that anyone can start selling on on eBay and Amazon without any experience on instruments. It is a highly commercialized marketplace which does not fit well for an artistic niche. Reverb on the other hand is an online marketplace meant to buy and sell music gear ranging from large dealers to small manufacturers. The entire experience is built to suit the music industry requirements. 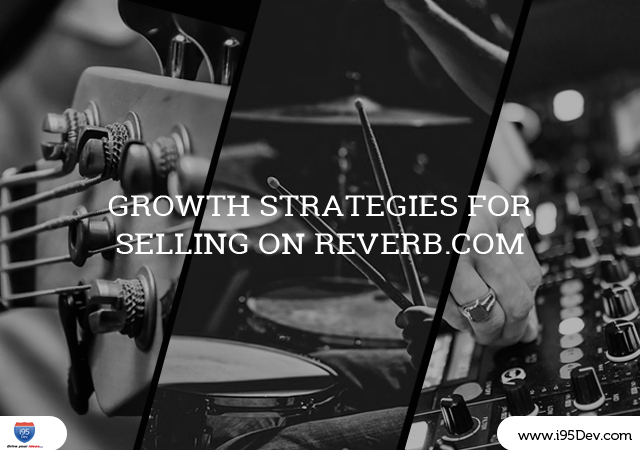 While selling on Reverb, there is a checklist, which is agreed by the most seasoned sellers on Reverb. Below are the key items on that checklist. Participating in ‘Reverb Sales’ – Reverb.com has a very robust sales process which actively allows e-commerce retailers to extensively promote their holiday and product category sales on ‘Memorial day, Thanksgiving day and other important holidays. Pricing your gear right – Reverb.com provides some great tools to help your customers take an informed decision such as ‘Reverb Price Guide’. This tool pulls out previous transnational data which determine fair market value for the music gear you deal in. This greatly helps you to optimize your price based on these inputs. Giving good customer service – Selling on Reverb allows you to focus resources on customer service and build reputation around it. Reverb, like any marketplace, gives your customers ability to give reviews and feedback. This system can be leveraged upon to improve the sales. i95Dev knows the importance of Reverb.com in maximizing ecommerce sales of businesses selling musical gear. During the advent of working with a client who deals in selling Musical gear, our team helped unify Magento e-commerce systems with Reverb.com. This customized integration solution helped them to hit peak performance because the integration helped them achieve. Consistency in Inventory: Selling on multiple platforms apart from your Magento e-store is just great, but risky too. If there is no proper way to view the amount of inventory you have in hand it will lead to overselling or underselling. This in turn leads to a loss of sale and affects brand loyalty. i95Dev solution to our client helped sync their Dynamics GP ERP system to their Magento e-commerce store and Reverb.com. This gave a single view for the inventory no matter where the customers of our client was shopping from. Streamlined back-ordering also became easy and it helped maximize their sales through multiple channels, and increased customer satisfaction few notches higher. Ease of Shipping: With the advent of ‘Amazon Prime’ it is very important that you as a business should consider exploring options like drop shipping. This is exactly what i95Dev integration solution was able to achieve for our client, ease of innovative shipping options. The integration helped them to streamline their drop shipping to perfection. Since our client dealt with numerous manufacturers and suppliers to source the musical gear they were able to keep track on the products available with them as well as the orders that have been placed through various channels such as Reverb.com and eBay. Transparent information in the backend was available and unnecessary back orders were reduced. This made their selling capability from Reverb.com easier. Great customer service: Leaving the technical aspects aside, selling musical gear requires artistic expertise. Our client had people on board who had excellent experience about the gear they were selling. i95Dev integration solution only amplified their capabilities further. No matter where their customer was placing an order from be it Reverb.com, eBay or their own e-commerce store it was made possible to synchronize in their Dynamics GP ERP. The availability of gathering the customer’s order history, buying pattern, brand preferences and even previous complaints helped them service their customer better. To top it all providing personalized discounts and recommendations to their customers became very easy. This achieved the ultimate ‘customer delight’ and a horde of loyal customers. Reduction of manual errors: This is particularly important for ecommerce business operations selling musical gear. The amount of orders would be particularly high during peak seasons such as ‘Thanksgiving’ and ‘Christmas’. Available resources would be severely underhand and if there is manual entries of orders placed form Reverb.com, eBay and your own Magento store into the ERP, it is a recipe for disaster. Mismatched billing address, delivery details, mode of delivery would cause loss of sales, increased returns, flurry of angry calls, reviews and mayhem. i95Dev integration solution eased out our client from all these situations with our customized solution. No matter where the orders were placed from be it Reverb.com or eBay the details entered were populated back to Dynamics GP ERP and stored forever all automated. This achieved freeing of resource time to help them service customers better and greatly reduced manual redundancy. Read our ebook on key reasons for ERP Ecommerce integration for more info on this. All these points mentioned above was made possible due to the third party marketplace integration, which was put in place. It connected their Magento e-commerce store, Microsoft Dynamics GP and even Reverb.com to enhance their workflow. In short our client was able to sell their awesome music gear to various customers through the platforms of their choice. i95Dev go beyond implementing solutions off the shelf. We take time in understanding the domain you operate in, the challenges you are facing and the shifts that would take place in the future. We can help design a customized solution, which is tailor made for your business and industry. We have acquired clientele over the years across industries. If you are an e-commerce business selling music gear or are contemplating a foray into a niche ecommerce segment, feel free to contact us at info@i95Dev.com.